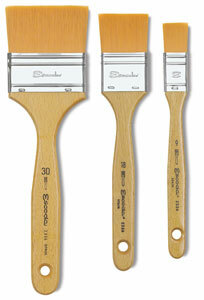 Escoda's Series 2336 is a flat, straight edged brush for painting broad passages, washes, and for varnishing. Escoda Barroco Toray Gold is the finest quality synthetic fiber available. Slightly stiffer than Toray white, it keeps an excellent point and edge for a soft, yet controlled application. Escoda cures each brush, resulting in remarkable spring and resilience of the hair. 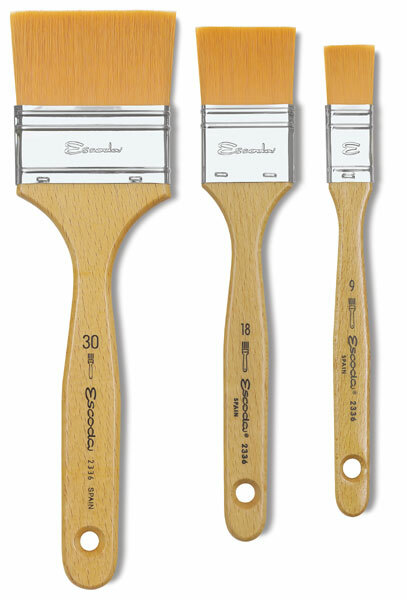 The Series 2336 brush has a matt-varnished wooden paintbrush-style handle, and a seamed nickel-plated ferrule.